Born Dec. 30, 1923, in Johnstown, she was a daughter of the late Ross G. Seese and Margaret Boerkoel (McDaniel). 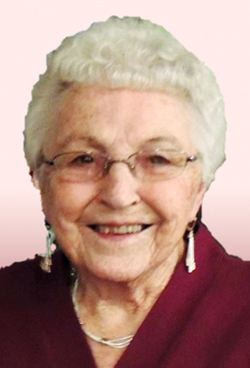 Jane moved to Altoona and graduated from Altoona High School in 1941. After graduation she moved to Williamsport and married John C. Lucas, with whom she shared 38 years before his passing in 1984. Together they had four children, Wayne C. Lucas, of Montoursville, Margaret “Peggy” Grimes, of Cogan Station, Edith “Edie” Long (Miles), of Montoursville, and Carol Stone (John), of Cogan Station; 11 grandchildren; 21 great-grandchildren; and three great-great-grandchildren. Jane was a 50-plus year member of Trinity United Methodist Church. She worked at the former Sylvania Electric on Westminster Drive for 29 years before retirement. She belonged to the Special Treasures of Cedar Chest Red Hat Society, the Hepburn Lycoming County Senior Citizens club and went to the Senior Center exercise class in South Williamsport. She enjoyed playing games, puzzles, gardening, cross-stitching and computer games. Jane especially enjoyed watching Penn State football, Philadelphia Phillies games, and the Game Show Network. She was an avid traveler who enjoyed bus trips and cruises. In addition to her parents she was preceded in death by three siblings, Robetta “Betty” Lucas, William “Bill” Seese, and Donald C. Seese, and a son-in-law Robert “Bob” Grimes. A funeral service to honor the life of Jane will be held 11 a.m. Tuesday, April 16, at Trinity United Methodist Church, 1971 Lycoming Creek Road, with Rev. Robert E. Stump officiating. Burial will follow in Twin Hills Memorial Park, Muncy. A viewing will be held from 10 to 10:45 a.m., at Trinity United Methodist Church. In lieu of flowers, memorial contributions may be made in Jane’s name to Trinity United Methodist Church, 1971 Lycoming Creek Road, Williamsport, PA 17701. The family would like to thank the Susquehanna Hospice team, especially Jen, and Hospice Chaplain, Tom Brokaw, for their exceptional care towards their Mom and Gram.